The Duchess sure isn't pleased about her husband’s love for the potentially dangerous motorsport. The royal, Prince William is known to be a big motorbike enthusiast he is famously riding around London on one on the eve of his wedding in April 2011. He was said to have put the hobby on the back burner after the arrival of Prince George and Princess Charlotte. However, that might have changed a tiny bit. It appears he hasn't loss his passion for the sport and was recently spotted arriving for a game in South London riding a red bike. Prince William has been an avid biker since he passed his test when he was 19 and has previously owned a number of bikes. William previously owned a £20,000 which could go from 0-60mph in 2.5 seconds. Now it seems that Kate, his wife and the Duchess isn't too pleased about her husband's love for the sport. She had previously admitted that it “fills her with horror” when her husband goes out on his bike. Speaking in 2015, she said, “I'm terrified. Hopefully, I'm going to keep George off it.” In the years gone by and even recently too, Kate has made no attempt to hide her dislike of her husband’s love for the potentially dangerous motorsport. 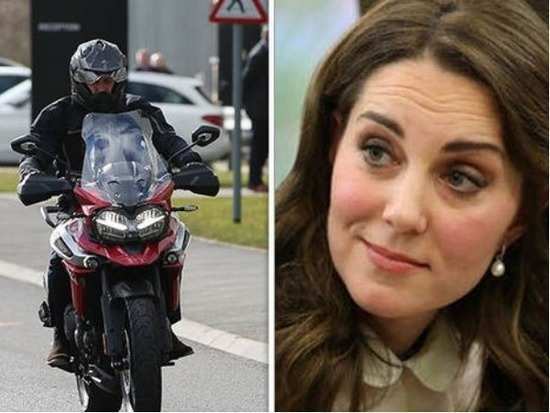 When asked earlier this year if Prince William still owned a motorbike during a visit to Scotland earlier this year, the Duchess of Cambridge told a well-wisher, "He's still riding it." "It always fills me with horror when he goes out on it‎," she added. The Prince is a keen biker and has been riding since the age of eight and Kate has made her dislike for the sport rather clear. We wonder if Prince George will be a bike enthusiast like his dad. Kate sure will hate that now, won't she?